History points to the legend of the Trojan Horse, 9/11, and the Japanese bombing of Pearl Harbor as classic examples of being caught off-guard. Guerrilla warfare, ninpo (ninjutsu), and Navy SEAL tactics were developed specifically to surprise the enemy. Heiho (strategy) really means effective combative "cheating". The term "fair fight" is a misnomer. So maintaining surveillance of one's suroundings is key. Nobody wants to be ambushed. Two of the precepts in the classical Chinese-Okinawan text the Bubishi states, "The eyes must see all ways", and "The ear must listen in all directions". Shotokan karate founder Gichin Funakoshi sustained this level of alertness even when performing a mundane activity such as taking a stroll outside. When rounding the corner of a building, he would make his turn wide and carefully to avoid being taken unawares. No matter where he was or what he was doing, he would be vigilant at all times. Studying a martial art cultivates the practitioner's ability to be cognizant of foreboding danger, and then taking appropriate measures to ensure safety. So much is said about Sensei Funakoshi. He is a myth. I suppose he was all those things, since so many people still say those things about him. A keen mind, a warm heart. 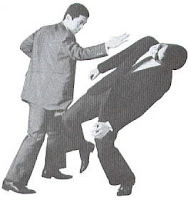 The Funakoshi story came from "Classical Budo", by Donn Draeger. Next to Musashi, Draeger's work is a must read for the serious aspirant, his research on the Japanese Martial Ways is unparalleled. Check it out. The Funakoshi story reminds me of something I discovered about Chibana. Chosin Chibana would never just walk into a room. He would pause at the threshold and scan the whole room with his eyes before entering. It wasn't an obvious motion either. While walking into a room, he would slow his gait, pause for a split second at the threshold, sweeping with his eyes and then enter. No one noticed this unless they were watching him carefully. Probably the most vigilant of all was Sokaku Takeda (Aikido founder Morihei Ueshiba's principal instructor). Before entering a building, including his residence, he would arrange to be escorted inside. He slept with weapons. Needless to say, Takeda had acquired some enemies during his long life.